Kirkland Lake Gold is starting 2019 with an impressive gold production which is delivering record revenues that I have estimated at $304 million. The company indicated on April 5, 2019, that it produced 231,879 Au Oz during the first three months of 2019, and sold 232,929 Au Oz. The company presents an appealing business model which fits a gold investment that behaves as a proxy for gold with substantial free cash flow and growth potential. Source: Fosterville Mine from Kirkland Lake Gold. The Toronto-based Kirkland Lake Gold (KL) is perhaps the most compelling mid-tier gold miners that we can find in the Gold industry. I have covered the company fourth-quarter results on April 1, 2019. Fosterville mine located in the state of Victoria, Australia. Also, Kirkland Lake Gold owns Taylor mine and Holt mine, both located in Northeastern Ontario. 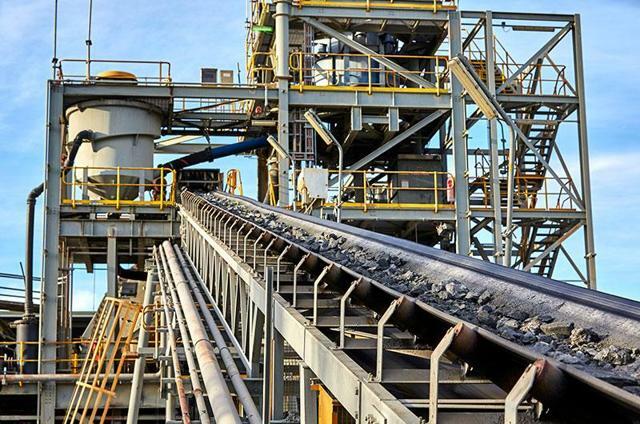 Finally, on February 21, 2019, the Company announced plans to resume operations at the Holloway mine placed on care & maintenance. However, production at Holloway mine in Northeastern Ontario is expected to ramp up during 2019 and total approximately 20k Oz this year. Note: Kirkland placed on care & maintenance its two operations located in Australia Northern Territory (e.g., the Cosmo mine and Union Reefs mill). Of course, the investment thesis has not changed and is supported by the capital requirement for investors to balance their equity portfolio by managing a gold position as a hedge against a conceivable faltering of the world/US economy or a sudden weakness of the dollar later this year or next year. While the US economy is great and the US dollar is robust as we speak, the risk of a turnaround is still a growing potentiality. Economists predict a downturn in 2019 and a likely recession in 2020, and gold may be the perfect beneficiary of this situation. Kirkland Lake Gold qualifies as a unique candidate with its excellent balance sheet and its high-quality asset base including two great mines in Canada and Australia which are considered as "safe jurisdiction" for the mining industry. Furthermore, Kirkland Lake Gold is also investing in Novo Resources and Osisko Mining. The Company owned a total of 29.8 million shares of Novo, representing 18.2% of issued and outstanding common shares as of December 31, 2018. The Company acquired 32.6 million shares of Osisko Mining for $47.8 million, representing approximately 13.6% of currently issued and outstanding common shares. Both Fosterville and Macassa achieved record production in Q1 2019, largely reflecting strong grade performance, as well as higher levels of mill throughput at Fosterville. 1 - Production in Gold Oz and details. The company indicated on April 5, 2019, that it produced 231,879 Au Oz during the first three months of 2019, and sold 232,929 Au Oz. The production is up 57% compared to the same quarter last year, and up 662 Oz sequentially. The strong production was due to record production at Fosterville and Macassa mines. However, Taylor mine produced only 12,377 Au Oz in 1Q'19. Source: Fun Trading from KL filings. AISC for the first quarter of 2019 should be about ~$555 per Oz and Gold price realized is about ~$1,306 per Oz this quarter. 2 - Revenues and trend. I have estimated a total of $304 million for the first quarter of 2019 establishing another new record. Based on almost 233K Au Oz sold during the first quarter of 2019 and an average gold price realized estimated at $1,306, I believe the total revenues will be about $304 million which is another record which provided another extra $78 million in cash. 4 - Cash Position increase to $410 million at March 31, 2019, from $332 million the precedent quarter. We also continued to generate substantial amounts of cash flow during the quarter, with our cash position increasing by $78 million or 23%, to $410 million at March 31, 2019. 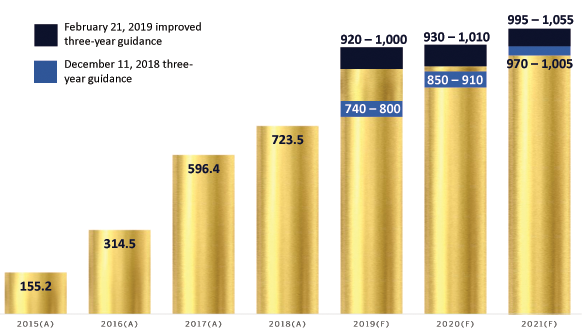 Our rapidly growing financial strength is a key differentiator for Kirkland Lake Gold and provides us with a great deal of flexibility in terms of financing our growth and examining additional opportunities for value creation, including returning capital to shareholders. 2019: 920k–1 M ounces (from 740k–800k ounces initially). 2021: 995k–1.055 M ounces (from 970k–1.005 M ounces initially). Kirkland Lake Gold is starting 2019 with an impressive gold production which is delivering record revenues that I have estimated at $304 million. The main engines to the strong company growth are the Macassa and Fosterville mines. The company presents an appealing business model which fits a gold investment that behaves as a proxy for gold with substantial free cash flow and growth potential. It is a rare occurrence in the "gold miners" category. The primary reason is that gold miners seem to be like gold bullion at first glance but perform more like equity. Thus, they play as a weak proxy for the precious metal in general. Gold miners are a poor proxy for gold allocations because they depend on industry competition and company specific factors beyond the gold price. Their valuation is dependent on profitability, operational costs, financial health, and other company specific risks while industry outlook and growth prospects dictate investor sentiment. Many of these factors move independent of fundamental drivers for the gold market, but come into play for equity investors. However, as I said in my previous article, investors will have to analyze the company stock and apply the right trading/investing strategy. It will be times when the stock will trade too high (overbought) or too low (oversold) depending on "expectation." In my opinion, Kirkland Lake Gold is forming an intermediate falling channel pattern (not indicated in the graph above) with line resistance at about $32.30 (I recommend selling about 20% of your equity position at this level,) and line support at $28.50 (I recommend buying and accumulating at this level). Gold price is a critical component in this case (proxy) as I explained in my conclusion. Generally, falling channel patterns are indecisive patterns and could end up with a positive or a negative breakout. I do not see KL going much lower than $28.50 unless the price of gold starts to weaken significantly. Instead, I believe KL will reach about $39 in 2019.